To understand how to play chess you have to get to know the chess pieces first and learn the objective of the game. After that you learn chess tactics, chess strategies and chess openings to be able to make good chess moves. There are 16 white pieces and 16 black pieces. The board has 64 squares on which your pieces can move. Each piece has a unique character and moves in a special way. See here how the chess board is set up properly and study the different abilities of each chess piece. Learn more about the king and the Chess Pieces and about lines, rows and square description and how to start a game. Every square has a name depending on its coordinates on the board. For example g2 or f3. You can attack the king with a piece. This is called giving a check. The king must move away to get out of the check or destroy the checking piece or move another piece in between the enemy piece and the king to block the check. This is not possible if a knight gives the check because knights can jump and there is no way to block the check of a knight. If a knight checks your king you must either destroy the knight or move away with your king. The objective of the game is to checkmate the king. But to achieve this you need to set up your pieces correctly in the first place to get a strong position first and win material or start a strong attack against the enemy king. You should learn to play a good chess opening. This will help you to set your pieces on strong squares right from the start of a game. Usually you win games because you have won pawns or pieces and thus have more material in the endgame where you can transform one of your pawns into a new queen. If this is possible the opponent will usually resign as it is just a matter of time until you checkmate him with your material advantage. It is just a waste of time to play on if your opponent has a queen or a rook and you got nothing but the king. You will be checkmated sooner or later. Just resign and start a new game. To understand how to play chess properly you need to learn chess tactics first to understand combinations. After this learn chess strategies and openings, study grandmaster games, analyze your own games and learn from your own mistakes. You always write down your moves in serious games played in a chess club or chess tournament. In a serious game always a chess clock is used and a time limit is given. For example, two hours each for 40 moves and one more hour for the next 20 moves. In this case a game can last up to six hours. When you play a serious game you don't talk with your opponent but concentrate entirely upon your game. A tournament game can last over 4 hours sometimes 6 hours. This depends on the time limit given in a tournament. You are not allowed to talk about your position with somebody else while the game is still is progress. When the game is finished you shake hands and sign up your score sheet and the score sheet of your opponent. After that you set up the chess pieces properly. Then you give the copy of the score sheet to the tournament organizer. After that you can analyze your game with your opponent in a different room to avoid disturbing the other players. 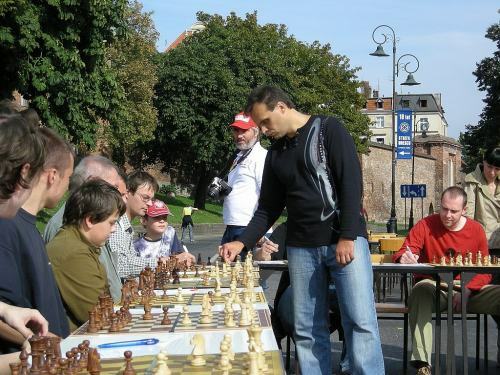 If you want to learn how to play chess properly then join a chess club in your town. There you can play every week in club tournaments and teams and you will get a lot of hints and ideas to improve your game and you will get a rating. Buy good chess books and study them to achieve a higher rating and better results. Get the unique downloadable Chess Teaching Videos by Grandmaster Smirnov. Read these chess tips to improve your chess. For beginners I recommend Logical Chess - Move by Move by Chernev because every move is explained here. Chess Tactics Learn to see tactical combinations. Chess Openings and learn some decent openings to know how to start a game properly and make strong moves right from the beginning. First start by playing the weakest chess program "Play Chess VI - Robo Chess", which does not play chess properly, regarding chess principles. It makes really bad moves. Try to beat it, then work your way up higher until you finally reach and play "Play Chess I". If you can beat this program then you are pretty good. If you are a beginner, it may take years until you can beat the best Chess Program. So take your time. To learn, how to play Chess properly, is not easy. Make sure to get some Top Chess Books or you might make the same mistakes for the rest of your life. How can you tell if you’re a Chess Expert? Join a chess club first to get registered as a chess player with the United States Chess Federation (USCF), then play in chess tournaments to get a rating. All chess tournaments that are organised in America report their results to the USCF, who will then calculate the rating for every chess player in the US and publishes regular updates in chess magazines. This procedure is similar in other countries. To get a rating you must provide data, this means you must play tournament games. The more games you play the more data they get and the more accurate your rating can be calculated. So play some tournaments this will get yourself an accurate rating. To ensure that players of roughly similar strength are matched up with one another, there are ratings sections, e.g. Under 1400, Under 1600, Under 1800 etc. If you are a beginner, having no rating yet, you play in the lowest section to get a rating first, which will be calculated and published some time after the tournament has finished. When you get your first rating after some weeks you know your exact rating and can work your way up playing better and better in future tournaments provided you study Top Chess Books. Chess expert is a rating and title given by the United States Chess Federation. It is awarded to chess players rated from 2000 to 2199. Players rated above are masters while players below are class players. Approximately 400,000 chess players in the US have USCF ratings, of which approximately 4000 are rated 2000 or better. Thus, chess experts are in the top 1% of all USCF tournament chess players. Read more at Wikipedia. How do I break into the local Chess Scene? Join a chess club then you are registered with the USCF or your national chess organisation automatically because you pay monthly fees and your rating will be calculated when you participate in chess tournaments.